Browse your application to see how easy it is, or start filling it out right now. Once you do, we'll set up your personal username and password. If you've already started your application, click here to log in and resume! You may also apply using the Common Application. Please note that if you plan to apply for federal financial aid, you will need to submit your SSN to W&J. I am a dual U.S. citizen. I am a permanent resident of the U.S. I am not a U.S. citizen or permanent resident. *What is your other country of citizenship? *What is your country of citizenship? *What is your visa type? Do you have another country of citizenship? *When do you plan to enroll? You have selected to attend this fall with classes starting August 22, 2018. You must already be graduated from high school to select this enrollment term. If this is incorrect, please change your answer to the previous question "When do you plan to enroll?" and select the correct enrollment term. *Please choose an application plan. Click here for more information about application plans. *How many credits do you intend to transfer to W&J? *Have you previously applied to W&J for freshman enrollment? W&J does not require applicants to submit test scores (SAT or ACT) as part of the admission process. Students who choose this option will be given full consideration, with no disadvantage for admission. Learn more about our score-optional policy. *Will you submit your test scores? Yes, I will submit my test scores. No, I prefer to not submit my test scores. *Will you be a resident or commuter student? Please note that commuters must live within 15 miles of the campus. Commuter status will be approved by the Office of Residence Life. Please indicate up to two areas of interest. Please provide the following information about your high school guidance counselor. Once you submit your application, an email will be sent to your counselor alerting him or her to the steps required to help complete your application. Are you taking any college courses you wish to earn credit for while in high school? Have you attended another college? What is the marital status of your parents/guardians? Mr.Mrs.Ms.Miss1st Lieutenant2nd LieutenantAdmiralAttorneyBishopBrig. GeneralBrotherCapt.Cmdr.Col.Dr.EnsignFatherGeneralGov.HonorableImamJudgeLadyLieutenant GeneralLordLt.Lt. Cmdr.Lt. Col.Maj.Maj. GeneralMaster SergeantMsgr.Mx.PastorProfessorRabbiRear Adm.Rep.Rev.Rev. Dr.SenatorSgt.SisterVice Adm.
What is the highest level of education Parent/Guardian 1 attained? *Do you live with this parent? What is the highest level of education Parent/Guardian 2 attained? 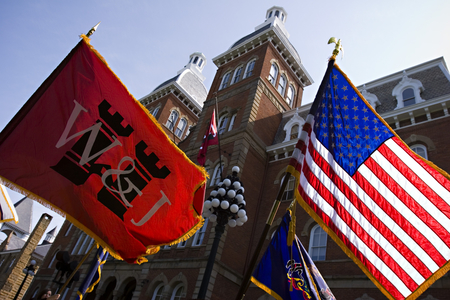 Do you have any relatives who have graduated from or are currently attending W&J? Would you like to add an additional relative? * I certify that the information included in this document is true, correct, and complete to the best of my knowledge, and I understand that deliberately providing false information is grounds for denial or withdrawal of an acceptance. Furthermore, I shall promptly inform Washington & Jefferson College if there is a change in the facts indicated. I grant permission to my previously attended institution(s) to release my official transcript(s) and other relevant academic records to Washington & Jefferson College. * I waive my right to review or access letters and statements of recommendation written on my behalf. *I acknowledge that I will be unable to make changes to my application after I submit it online. I have ensured that my application is accurate, complete, and ready for submission. Remember: We must receive your application in addition to the items listed below before we are able to process your application and give you an admission decision in three weeks. Once we have received all materials, we will process your application and send you an admission decision within three weeks. If any changes need to be made to your application, please reach out to us at 724-223-6025 or admission@washjeff.edu. Details of how to access your status page will be emailed to you shortly. Please click Submit below to submit your application.